I couldn't wait to write about Kazam Screencaster which I've tried almost daily since it's pre-alpha release but unfortunately it didn't work. However, a fix for Ubuntu Lucid was released two days ago and today the Maverick bug (unable to record video - which was crucial, considering this is what Kazam is built for) was also fixed (the bug was actually in FFmpeg) so Kazam Screencaster should finally work for everybody! Kazam is a brand new screencasting application for Linux which records both the audio and video in an .mkv format and you can either save it to your computer or directly upload it to YouTube or VideoBin (more websites are expected to be added soon). I've tested Kazam Screencaster in both Ubuntu 10.04 Lucid Lynx and 10.10 Maverick Meerkat. While most stuff works, there are still 2 bugs in Maverick only: the AppIndicator counter stays at "1" when you record a video (instead of the "1" icon changing into the recording icon) and the notification bubble text is transparent). Other than that, Kazam still lacks in features: you cannot change the video quality, record an area of the screen or change the format (so .mkv only for now) / codec. But Kazam is looking good already and since it's still very new, expect a lot more features soon! 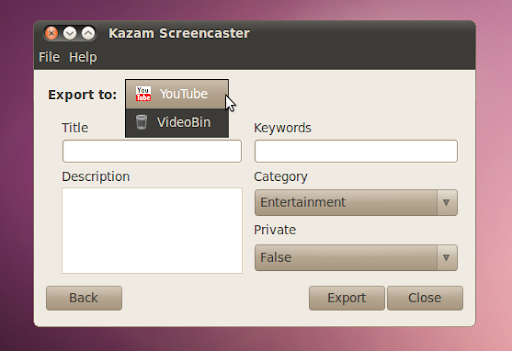 If you're not using Ubuntu, grab Kazam Screencaster from HERE (you'll need BZR to download it). Found a bug? 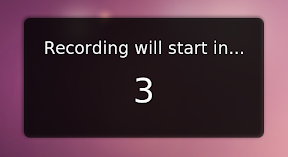 Report it here: https://bugs.launchpad.net/kazam.